AllegroMedical.com presents The Labrada Nutrition Lean Pro8 - Chocolate Ice Cream Protein Supplement. Super Premium Protein Powder. 8 Fast, Medium, and Slow Release Proteins for All-Day Lean Muscle Support! Lean Pro8 Super Premium Protein is made to meet the high protein needs of hard training athletes. Lean Pro8 gives you concentrate muscle-building protein in one delicious, easy-to-make shake. 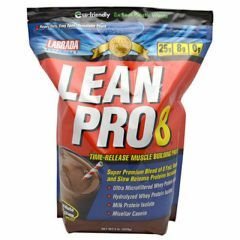 Lean Pro8 is the best tasting protein powder ever made. That's why it's the main ingredient in award-winning Lean Body meal replacements, RTD shakes, and bars. 8 fast, medium, and slow release proteins give you a sustained flow of vital amino acids to support intracellular nitrogen retention levels for faster muscle growth and strength increases. 8 grams EFA Plex containing natural-source omega-3 and -6 fatty acids, medium-chain triglycerides, flaxseed oil, and borage oil to increase energy and fuel growth. 8 grams of Fiber Plex dietary fiber per 100 grams, providing 28% of the RDA for fiber to support superior absorption and promote intestinal and cardiovascular health. Over 4,700mg of BCAA's (Branched Chain Amino Acids) per serving. BCAA's have an anti-catabolic effect (prevents muscle tissue breakdown.) Over 3,500mg of Glutamine & Glutamic Acid. Studies show that supplemental glutamine can help prevent muscle breakdown. No Maltodextrin. No Aspartame. No Trans Fat. LeanPro Super Premium Protein Blend (Yielding Fast Acting Micro Ultra Filtered Whey Protein Concentrate, Cross Flow Micro Ultra Filtered Whey Protein Isolate, Hydrolyzed Whey Protein Isolate, Medium Acting Agglomerated Egg Albumin, Slow Acting Micellar Casein, Calcium Caseinate, Milk Protein Isolate, Milk Protein Concentrate, Glutamine Peptides), EFA Plex High Energy Essential Fats (Sunflower Oil, Non-Dairy Creamer [High Oleic Sunflower Oil, Fructose, Sucrose, Di-Potassium Phosphate, Tri-Calcium Phosphate, Soy Lecithin, Tocopherols], MCT Oil, Flaxseed Oil, Borage Oil), Natural & Artificial Flavorings, Cocoa, MCT Powder (Medium Chain Triglycerides, Non-Fat Dry Milk, Disodium Phosphate, Silicon Dioxide), Fiber Plex High Fiber Complex (Polydextrose, Fibersol 2 Fiber, Inulin, Cellulose Gum, Xanthan Gum), Salt, Sucralose, Acesulfame Potassium.